The Cohiba Panetelas is a savory little Habano, a medium-full Laguito No.3, 4.5” (115mm) long, of 26 ring gauge, and comes in a cabinet of 25 cigars. 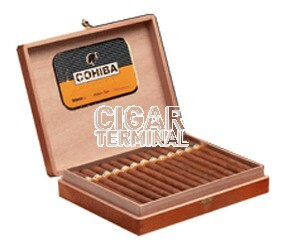 The Cohiba Panetelas is a very good option for a short cigar and when you still want a premium quality smoke. • Despite being short, it is a complex cigar, with amazing flavors of coffee, grass and of nuts. • A great morning creamy smoke with a medium-full body. This cigar is simply provides you with classic Cohiba flavors in a shorter smoke. The cigar is looking good, being the thinnest hand rolled cigar out of Cuba, and the wrapper has a dark brown rustic look. The wrapper has few veins on it, it’s not too smooth but it is rather oily and shiny, and the construction is of premium quality. The triple cap is beautifully applied; it is firm with just the right amount of give. The wrapper smells of cedar, dark coffee, sweet spices with notes of lemon. The head clips cleanly; the draw is nice while a bit tight, however it opens up as the cigar progresses. Once lit, it burns beautifully, while it shouldn’t be left unattended for too long or the cigar might tunnel. However, in this case, the burn corrects itself after few draws. The cigar releases a voluminous and chewy smoke. The ash is of light grey color and doesn’t hold on very much. The first third of the cigar starts off with a strong and powerful flavor of tobacco. The opening is at a full body at this point. Soon after, some notes of toasted nuts and of leather appear. Towards the first inch, the body recedes and settles at a medium-full level. Other flavors slowly join the mix, mainly some dark and roasted coffee beans. Some sweetness also comes forward, with some notes of honey. The finish is spicy and sweet, and overall, the cigar is not harsh whatsoever, it is rich and creamy. In the middle third, the flavor mix evolves into more traditional Cohiba flavors. Some grassy flavors become noticeable, merging with some deep cacao notes. The nuttiness has completely receded, while the dark coffee and dark chocolate are becoming dominant. The flavors are bold and intense. The body remains in the medium to full range. In the final third, the cigar doesn’t get harsh nor bitter. The flavors do not evolve too much except for the spice that is ramping up while the sweetness remains on the finish. The main flavors are still the deep and rich coffee while the grassiness has moved to the background. It gets a bit warm towards the nub, and it has to be put down while the aromas are still very enjoyable. In summary, it is a quite complex cigar despite its short size, with plenty of strength and with some beautiful rich and creamy Cuban flavors.